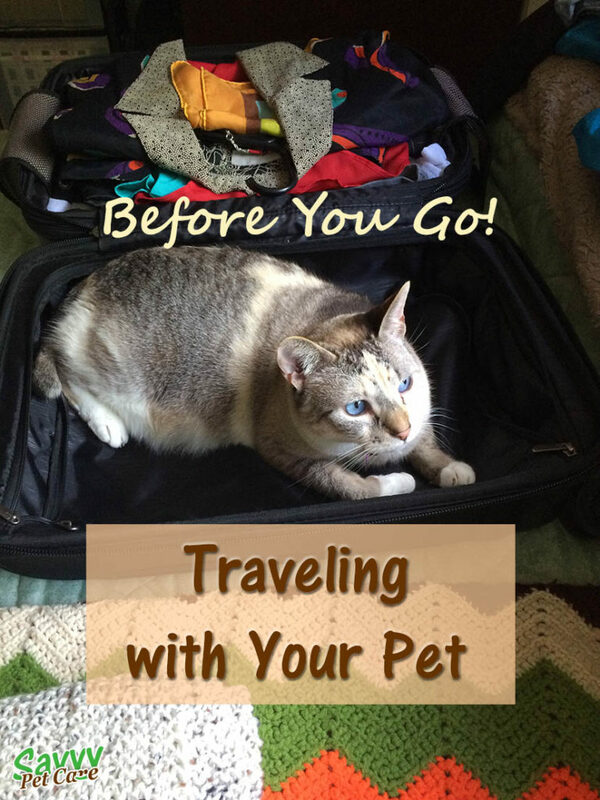 If you are planning a vacation that includes the family pet (yes, some people travel with their cats and even their pocket pets), there are several things you should do before you go. Proper planning can mean the difference between a fun experience for all involved or a disaster. 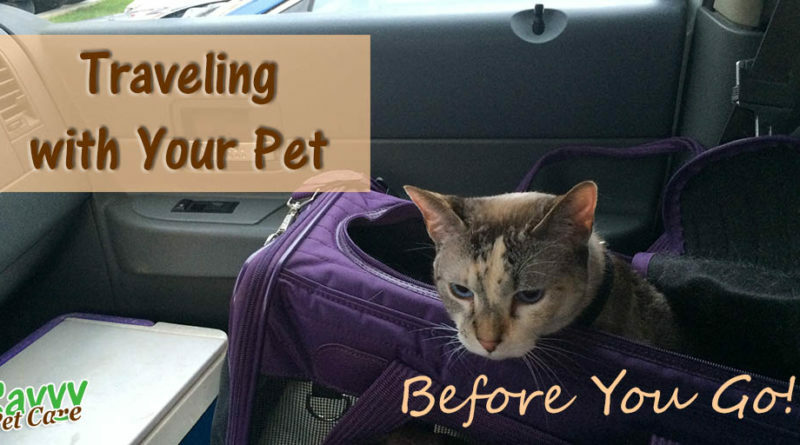 Traveling with Your Pet — What You Should Know Before You Go! Make sure your pet is healthy. A trip to the vet for a check up is recommended. Be sure your vaccinations are up to date, for pets that require them, and you have health records. These records are required for airline travel. 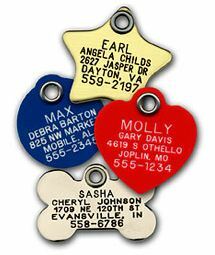 Have a strong collar with ID tags. Consider having your dog or cat microchipped for additional protection and bring a photo of your pet with you. A crate is the best way to keep your pet safe in the car, is required for airline travel and will keep him out of trouble in a hotel room. If your pet is not already crate trained, when you are ready to leave for vacation is not the time to start! Dogs can panic when unexpectedly enclosed in a crate. If you keep it positive and introduce it slowly, the crate can become your pet’s safe haven. If you are traveling by car, get your pet used to this ahead of time. Many animals are terrified of riding in the car but this fear can be overcome with patient training. If you are planning to travel by air, be sure you know the airline’s policy regarding pets. Pets are not allowed on Amtrak or Greyhound buses. Some cruise lines allow pets. 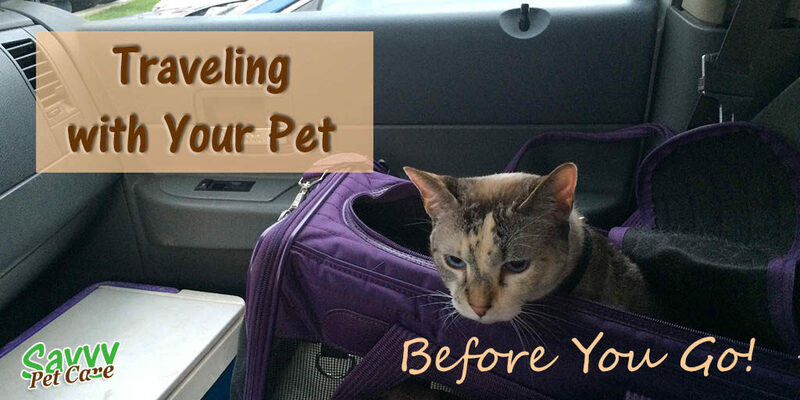 Traveling by car is usually the best way to vacation with your pet. You’ll want to plot out your rest stops and plan to stop every 3-4 hours. Knowing where a few veterinary hospitals are along the way is also a good idea and could save your pet’s life if a sudden illness occurs. Pet-friendly hotels usually do more than just allow pets. (Pet friendly often really means dog friendly so be sure you know your hotel’s specific pet policy.) Many offer lots of special amenities like special dog beds, turndown service (perhaps with a treat on the pillow), dog spa services and doggie day care. Know what amenities are available and what cost is involved. Many hotels charge a non-refundable pet deposit upon arrival, then a daily pet fee. Some even tack on a special cleaning fee. Bottom line, before you choose, do your research. Many professional pet sitters do in-room sitting at hotels. Some hotels don’t allow you to leave your pet alone in the room. If you find you want to do an activity that isn’t pet-friendly, Pet Sitters International can help you locate a sitter pretty much anywhere you travel!